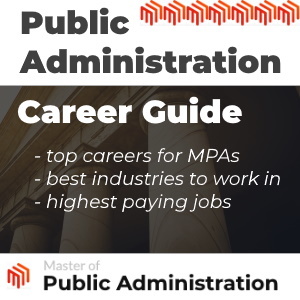 In this guide, you can find advice and information about careers in public administration and how to pursue them. Our team of experts has looked deep into educational programs to assist you with seeing different specialization paths and the career outcomes of each. For students that are undecided about the type and level of degree they want to pursue, there are also included references for careers at different degree levels. Read more below to learn about this great field and what it consists of. When you earn your Master of Public Administration Degree, you can have a world of professional opportunities to pursue. Which direction you choose should really depend on your goals, your personality, and what kind of industry best suits your reasons for wanting a career in public administration. Some professionals have a desire to work in the government at the city, state, or federal level because they want to help manage their city's, state's, or nation's services and improve community relations. Many professionals working in public administration work as a consultant for private companies with government agency contracts. Consideri reading our writeup of the highest paying public administration jobs. You can also work in many important roles in government or the private sector with this degree. Whether you want to work in health, communications, legal areas, public transportation or other areas, you can be an important part of change in your community, your state, and even across our entire nation. Those who earn their Master in Public Administration can work in civil service, as education administrators, public administration consultants, program analysts, human resources director, public works director, and many other positions. Your position may involve long-term project planning, budget analysis, ethical decision-making, fundraising, marketing, curriculum development and training, public relations, and many other elements. Upcoming professionals that are interested in the field of public administration may benefit from learning more about the actual constituents of this degree program and the benefits of pursuing it as a career focus. Public administration is an increasingly popular field that calls upon people that are interested in being a part of the widespread public service field. This can include services provided at the local and state level, those involved with public health and safety, local government and education. The best method for getting involved in the field of public administration is through obtaining a degree. At different degree levels, students can learn about finance, human services, policy and maintenance of organizations that serve the public. If you enroll in such a program, you could also learn leadership skills that are relevant to this type of career and communication skills that can get you up to par with others in the field. Your influence in this field could help to increase public services and organizations that were put into place to assist society with living normal and healthy lifestyles. Where Can You Work with a Degree in Public Administration? Now that you have been introduced to the field of public administration, you may be wondering what type of work settings you could expect to see as a professional in this area. The truth is – public administration specialists can be found in many different areas in common society. A lot of professionals that hold this degree work in government positions that are concerned with developing better policies for everyday life. Others may find a better fit in businesses or non-profit agencies that assist with providing services to the public. A lot of leaders within your current community may have an education in public administration, since this degree program is focused on the needs and programs present in society. The list below outlines a few of the work settings that are common for professionals in this field. Business: Upcoming professionals that have an interest in business may have the option to use a public administration degree to meet their desires. In public and non-profit agencies, professionals that have an education in public administration can assist in the development of helpful policies, management of teams of employees and potentially even become effective and reliable leaders. Having a strong background in sales and service could help you to land even more lucrative positions in the business field. Local/City Services: Since public administration degree programs may be focused on providing great public services to society, graduates in this field may be a great fit for local and city services. This can include positions in housing, family wellness, healthcare and civil services. Since there is a wide array of potential career options for those that obtain a degree in public administration, there is a variety of areas within the city system that graduates could find a place. Government – All Levels: Whether you work in agencies that specialize in social research and reform or healthcare, there are branches of the government that can be suitable for public administration graduates. It is necessary for the U.S. Government to provide services to the public that are concerned with the improvement of social services, better education programs and ample leadership for different political agendas. If you have an interest in government positions, this may be the route for you to take. Bachelors: Public Relations Specialist – $59,300 on average per year (BLS). Masters: Budget Analyst – $75,240 on average per year (BLS). Doctoral: Administrative Service Managers – $94,020 on average per year (BLS). Students that are interested in pursuing their degree online may be skeptical of the quality or consistency of online degree programs. At one point and time, online degree programs were unheard of in society, making an adjustment period necessary for people to become accustomed to them. The integration of reliable online degree programs and the accreditation process has allowed for more people to invest their trust into these programs so that they were given the opportunity to prove their worth. Over the last several years, educational institutions have worked hard to establish their reliability in the field of education, with most obtaining accreditation equal to colleges that are traditional in nature. 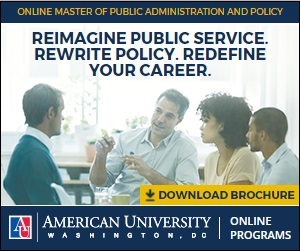 Public administration degree programs can be found in large numbers online. Our team of educational experts has researched some of the most reliable online public administration programs available for new college students. The list below provides a few of the more popular options for students at each degree level. How much you can earn with your master of public administration can vary greatly, and depends on the type of work you do, where you live, and what kind of organization you work for. You can view the highest paying public administration jobs, or read on for some salaries for occupations that you can obtain with your masters in public administration. This career will have you studying how political systems developed, and how they operate today, with areas of work that include governments (local, state, federal), laws, changes and forces that help shape the political climate. According to the Bureau of Labor Statistics, political scientists can earn a median wage of $99,730, according to 2015 data from the US Bureau of Labor Statistics (BLS). This role is growing as fast as the national average and pays a median wage of $68,220 per year, per the BLS. If you work in this area of public administration you can help your city grow functionally while helping the community improve at the same time. Internships provide common entry points into this kind of position. So far, New Jersey is the only state to require licensing for urban planners (BLS). This is an occupation that you can technically qualify for with your bachelor’s degree, but you can be more competitive and stand apart from other applicants with your masters degree. The BLS states that those who work in this occupation can earn a median wage of $94,500 per year. Plus, the job outlook for this profession is 17% anticipated growth from 2014-24 – which is much faster than the national average (BLS). This is another career you hear about when researching degree programs in public administration. Human resource managers have important responsibility to make sure the administrative functions of their company or organization is running smoothly. They also help bridge the challenges and differences between management and employees. The BLS states that human resource managers can expect to earn a median wage of $104,440 per year, according to 2015 data (BLS). What Other Areas of Specialization Are There For This Degree? Just like working with individuals, public administration can be a diverse field that is constantly changing. When you are a professional that is concerned with the public, you can have many different focuses that pull you in different directions each day. The best way to provide focus to your degree and career is through choosing a specialization for your degree program. When you choose a path to pursue, you can focus your studies on one particular area so that you can learn the most and provide the best expertise to your field. Some of the more popular specializations for public administration programs are those that focus on healthcare management, business and city services. Take a look at the list below. Urban Management: Public administration degree programs can help you to pursue careers in human resources within the public sector. This career field involves helping employees understand and apply for benefits, assisting during the hiring and termination processes, and providing training to employees that are responsible for carrying out daily tasks for your organization. Non-Profit Management: Being a part of a community development team, or leading one, can mean you are able to make tremendous differences in the community in which you live. Professionals in community development may review their current location to ensure that improvements are made, programs are in effect, and people are within reach to helpful programs for their individual needs. Healthcare Management: The popularity of the healthcare field is well-known with college students and new professionals alike. Since this field is one of the most widespread employers of new graduates in the U.S., it is a great place to integrate knowledge from public administration degree programs. If you pursue a specialty within healthcare management, you could end up having a diverse set of skills that could bring you many opportunities in your future. The median annual wage for a bachelor’s degree is $50,000 while the median annual wage for masters degree is $65,000. For bachelor’s degree holders, the median wage is $70,000 and for masters degree holders it is $90,000. There can be a significant boost in salary, depending on whether you hold your bachelor’s or masters level degree. When you speak to schools about salary levels for professionals in your area, be sure to ask about the salary gap for these degree levels in your occupation of interest (Salaries Sourced from BLS). Like any area of study, there are world famous organizations and companies that graduates may want to work for. These companies that “everybody knows” sometimes provide the most jobs in their sector, the most famous products, or make the biggest impact in their area of focus. If you are earning your MPA degree, you may look at these top organizations as your barometer for what you want in an employer or role. Yes, the world’s most famous intelligence gathering organization needs people with MPA degrees to help manage the endless bureaucracy and policies that affect the organization. In fact, all law enforcement agencies, such as the ATF, FBI, and others have to pay attention strict administrative rules and procedures, and may offer career opportunities for MPH grads. A world-renowned leader in IT company that creates networking technology that they handle from design to manufacturing solutions. They are known to hire MPA graduates to help create effective and efficient workplace processes and policies. If you want to work in the nonprofit sector, this organization is a great place to start your search. They need quality MPA’s to help make sure their programs run smoothly. With all of their international work, MPA’s in these roles may be able to travel and see the world! American MPA’s can play a pivotal role in helping shape our stances towards international policies and how they align or conflict with our homegrown values and standards. Like the AmeriCorps, working for the United Nations will help you network with people from all cultures who are doing their best to maintain a peaceful planet. Graduates with their Masters in Public Administration degree can help major news outlets vet current policy designs being put forth by politicians in D.C. The talking heads and commentary style journalists need the insight of those who understand how to research and understand where different political minds rest on these issues. Do you think most $100 million productions (low budget these days) can run smoothly without people who understand how to manage unions, hectic production schedules, shifts in schedules, laws and licensing. You can’t be as big as Google is in tech and not need the help of graduates of MPA programs. These professionals help keep Google’s offices running smoothly across a wide network of projects, teams, initiatives, and everything else that company is doing – it’s impossible to keep up! For millions of Americans, this is their favorite non-profit and news source. NPR needs MPA’s to function effectively, as they deliver news, interviews with political figures, activists, and promote public interest stories. NPR has satellite stations in major cities across the United States where MPA grads can pursue employment. This organization works to develop the next generation of tomorrow’s teachers. They help education students across the US work towards careers, by offering them positions in classrooms in low income areas. 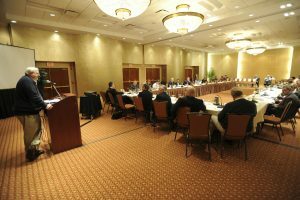 With your MPA you can help this organization stay focused, execute its mission, and help them shape education policy in your own way. What Careers Can You Have with an MPA Degree? Working as a policy manager is a multifaceted role that can include presentation data and information about policies related to your organization’s focus. For instance, you may work for a think tank to help private businesses and government agencies solve complex problems in a wide variety of areas, such as education, taxes, military affairs, and more. Think managing a team in an office is tough? Try managing an entire city, making sure all your public services were working efficiently. This work will include worker performance, project planning, budgets, and other areas where the city is responsible to the community. This role is for highly organized and proactive workers who want to work in agencies that serve the public and apply policies created by the government. In this role, you may work directly with the public in a variety of ways, and relating to all kinds of legislation. If you choose to work in this role, your primary concern, especially in non-profit work, is making sure you have the proper funding to operate every fiscal year. You will lead the plan to tap financial resources and generate funds as outlined in the plan you create. You will be held accountable for the execution of this plan by those at the executive and leadership level. This role may also include writing grants and personally executing strategies. In this role, you can work in the expanding healthcare industry. You would be a leader in developing the core objectives for your team or organization. This may involve making sure staff has the appropriate training and up-to-date equipment on which to perform their tasks. You may also be responsible for making sure the records in your facility are collected, stored, and shared through a secure process. These professionals are accountable for designing and implementing programs at all types of companies. This role includes helping develop the guidelines for conduct and policies related to employee behavior. They may have to engage directly with the community and attend public events to shore up support for their program. Coordinating all aspects of the program, as well as creating the budget and writing grant proposals can also be part of this role. Those who earn their MPA are also a natural fit for human resources management. With your knowledge of how to approach policy and procedures, as well as creating them from scratch, you can work in several types of companies in this role. 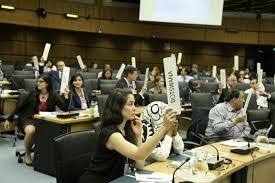 You can bet there are many international organizations who would benefit from having an US graduate of an MPA program. With your knowledge and skills you can help bridge the divide between our nation and those who seek our partnerships to combat global challenges. With your MPA you can work in almost every type of non-profit in management or leadership roles. These positions can vary from every type of organization you can think of that perform charity or public service related work. Whether you want to help manage your local animal shelter or work for the United Way in a management position, you can do both with this degree. In this role you can make sure that transportation operations run smoothly at your company. This work is typically fast-paced, involves working with drivers, overseeing projects, and communicating to customers, as well as helping with the financial aspects of the company. If you really want to learn more about jobs you can acquire with your MPA, contact schools in your area today to learn more about their programs. Don’t forget to compare those with online, accredited programs that teach students in your state.